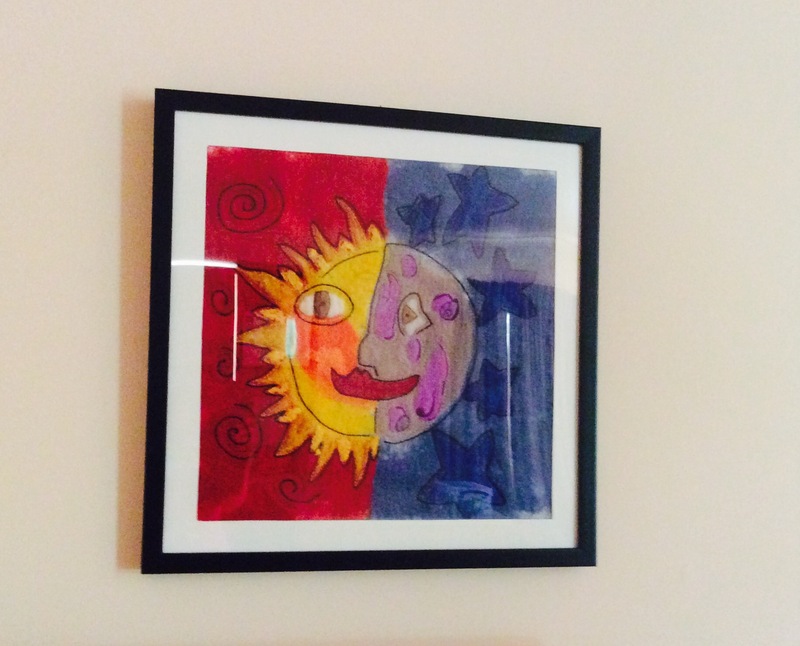 I was inspired to make this SunMoon felted piece by a remarkable drawing from my young niece. In crayon, this picture sings with movement and life. It is so animated! and happy! I love it. I love how the moon is in profile while the sun is facing forward. Seeing these pictures now I realise I forgot the eyebrows. Or maybe that was a design decision? I can’t remember. To make this piece in felt, I started with a white background then laid out my blue and red fleece around a circular placeholder to get the shape. I used more fleece, prefelt and cheesecloth scraps to complete the basic design. Then I wet it all down with my trusty bulb sprayer and felted it. Next it dried on the clothes line and then a quick needle felt to ’round out’ the moon which had become misshapen during the felting process. I then did some machine embroidery to outline the shapes and add some detail. Then I hand stitched black accents and outlines. I completed it with a black frame and I’m pleased with the result. Although it is quite a different piece to the original inspiration, I enjoyed the challenge of making it and am very thankful to my niece for such a beautiful design. Rosella says: All your felt pieces look good and I also think that my drawing is good as well. 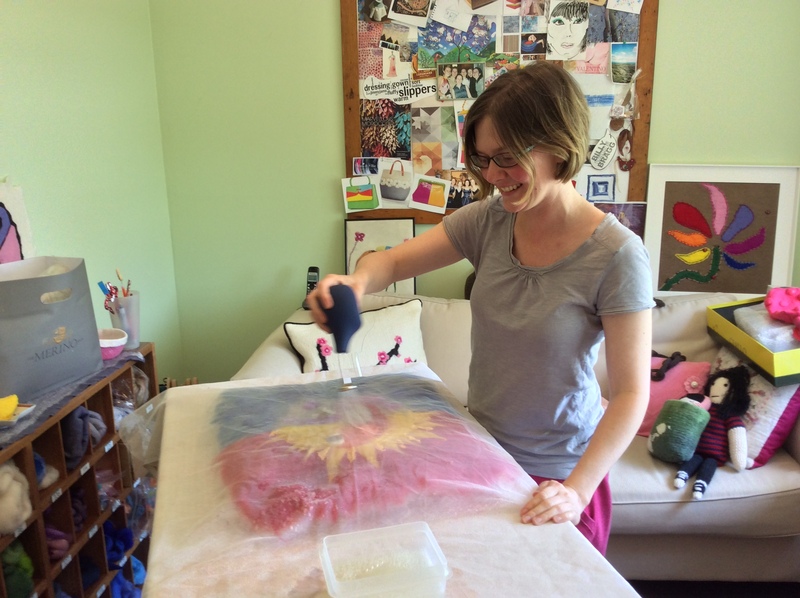 I think I might want to make my own felt piece. I love it, especially the details you’ve stitched on. It looks fabulous in the frame too. Thanks for showing us! 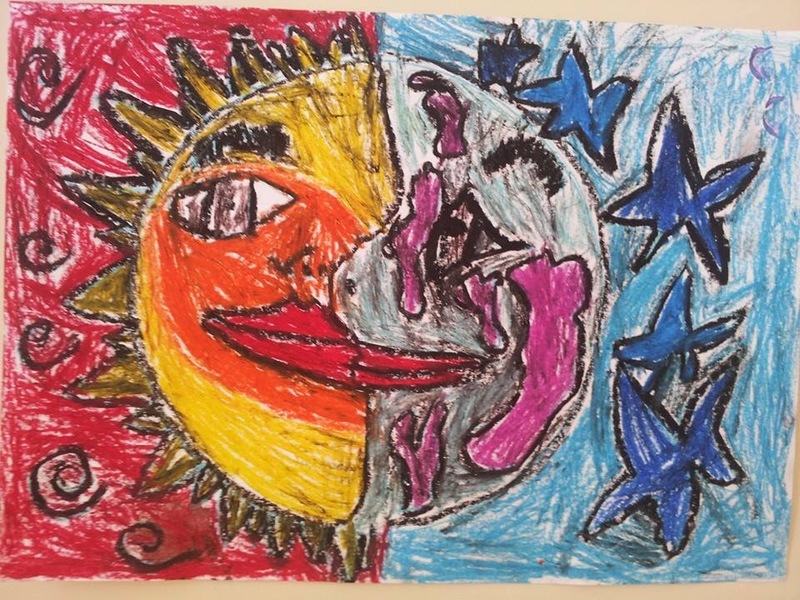 This entry was posted on 22/10/2015 by flicstar in Wall Art and tagged child's drawing, embroidery, felt, inspiration, machine embroidery, moon, sun.